I was scratching my head, wondering how to attack today’s interesting challenge when I recalled driving from my home into Sydney and triumphing over a highly contrasting and dangerous weather phenomenon. The driving was dangerous as visibility was severely restricted and the danger was compounded by many drivers, myself included, taking their eye off the road to take photographs whilst still driving. The date was 23rd September 2009. 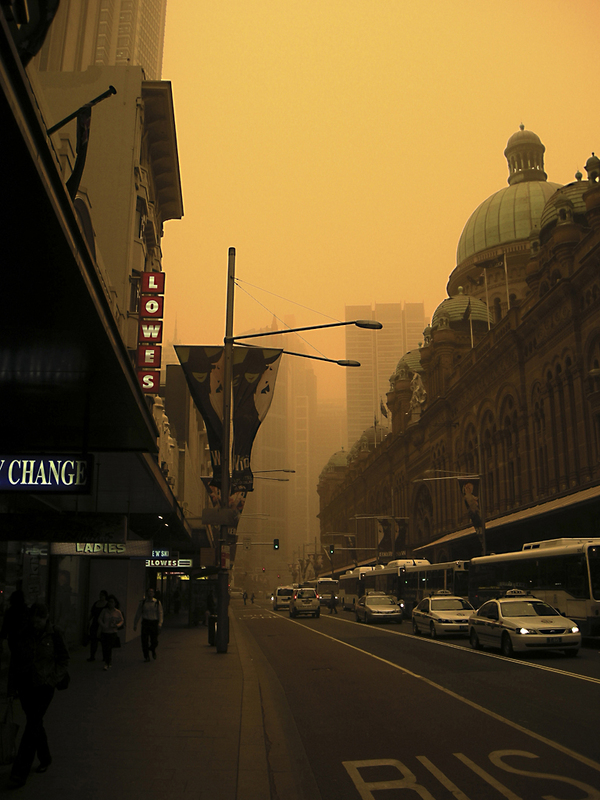 Conditions that day had never been seen in the history of Sydney’s weather records and have not been seen since. 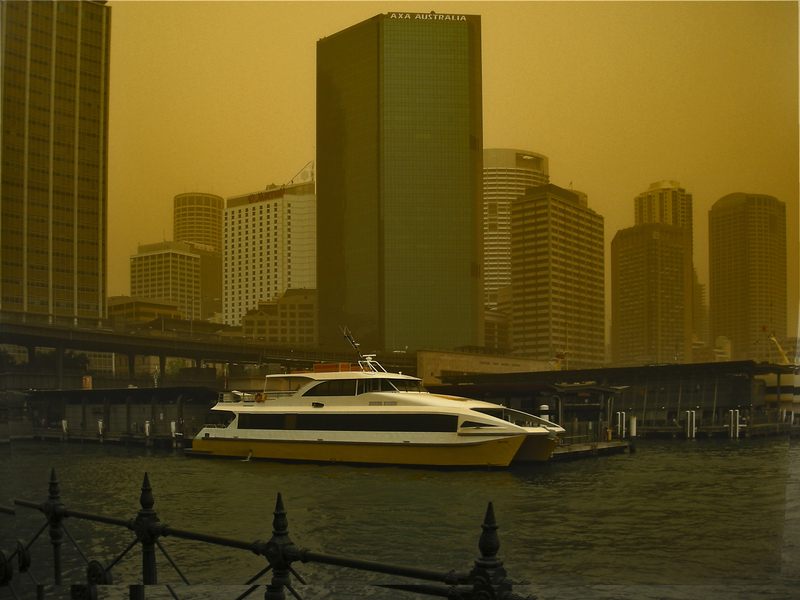 Much of inland Australia had been experiencing drought for a considerable time and strong winds from the interior picked up red dust and carried it towards Sydney, situate on the eastern coast. On September 23rd, when I left home about 6.AM for the 200 km drive into Sydney City, the sky had a reddish tinge but I thought nothing about it, having not heard the severe weather warning. VISIBILITY DOWN TO ABOUT 100 METRES AND VERY STRONG WINDS. 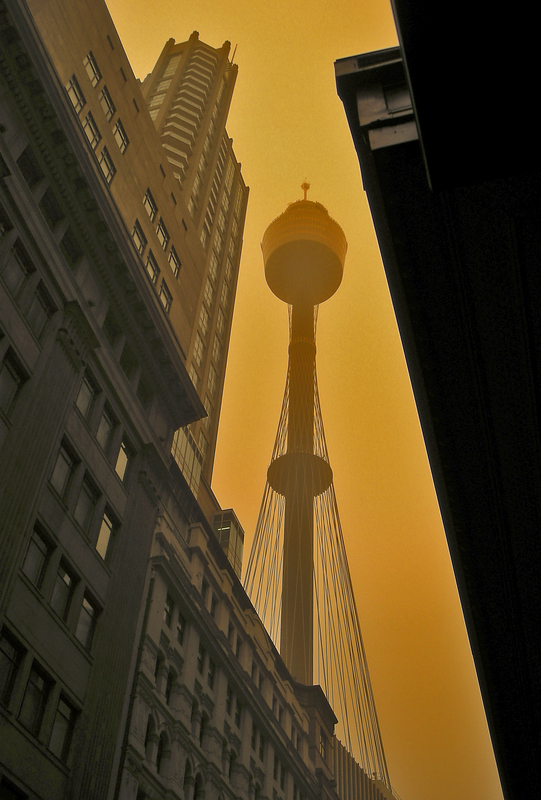 As I had an unbreakable appointment in the City I continued on, refraining from taking more photos and mistakenly thinking the red dust would clear. Big mistake. 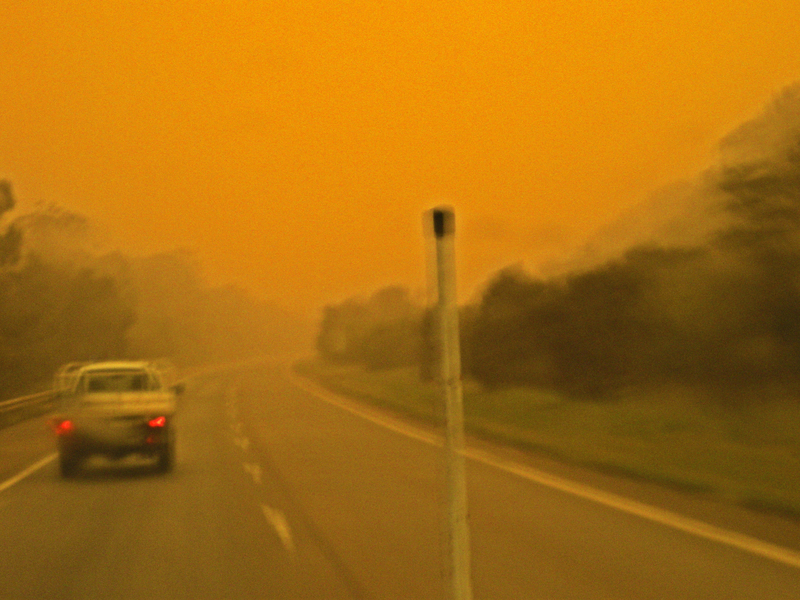 Finally reaching a few kilometres from my city destination, the red dust was a little heavier and the traffic was at a standstill. For some reason all I could think about was the Landrover’s air cleaner, a natural reaction by a typical bloke. This next image was taken near by to where I left the Landy at a mate’s place, sometime after 8.30am and I continued into the city on foot and by train. PRINCES HIGHWAY, TEMPE. VISIBILITY LIMITED, TRAFFIC NOT MOVING. AUSTRALIA SQUARE TOWER PARTLY OBSCURED BY RED DUST. LOOKING SOUTH ALONG GEORGE STREET, SYDNEY, NEAR THE HISTORIC QUEEN VICTORIA BUILDING ON THE RIGHT. 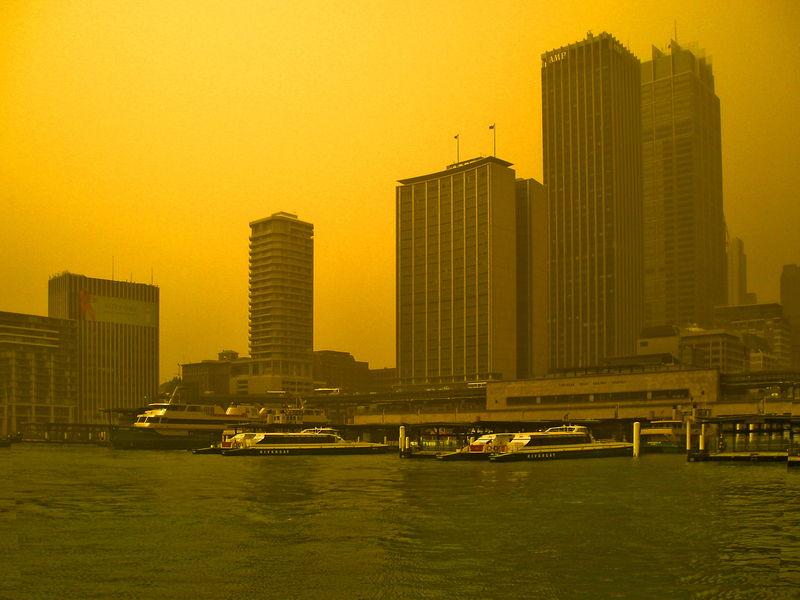 LOOKING SOUTH TOWARDS CIRCULAR QUAY, LUCKY COMMUTERS’ CITY MARITIME GATEWAY TO THE CENTRAL BUSINESS DISTRICT. ANOTHER VIEW OF CIRCULAR QUAY AND SOME CITY BUILDINGS. 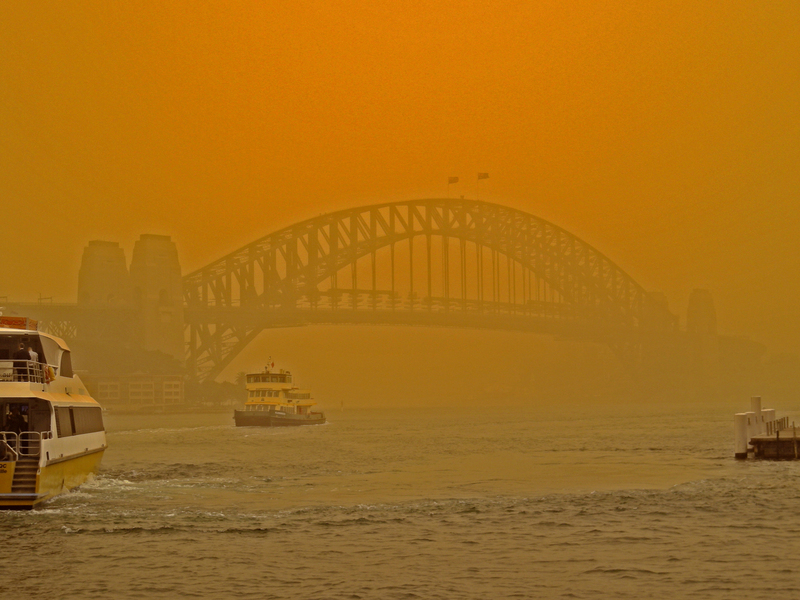 SYDNEY HARBOUR BRIDGE, PARTIALLY OBSCURED BY RED DUST, TAKEN FROM THE SYDNEY OPERA HOUSE FORECOURT. The winds abated towards the afternoon, the dust settled and the massive clean up began. 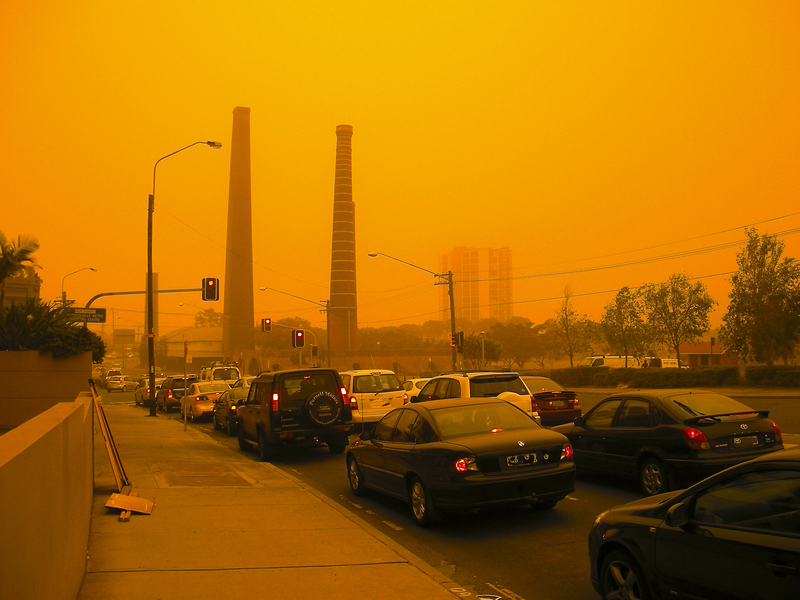 A sad epilogue to this unusual and rare weather event was many people suffered severe breathing difficulties because of the dust, particularly the elderly and those suffering from asthma. Vehicle collisions were legion. Retail sales plummeted but on a positive note, air conditioning technicians and window cleaners together with their company owners, rubbed their hands in glee at the prospect of the workload to come. I retrieved my Landrover and returned home without incident. On arrival home I immediately serviced the air cleaner and am pleased to report it kept all dust out of the Landrover’s engine and no damage was incurred. Just goes to show that every cloud has a silver lining. For the technically minded, all the above images were made using a Nikon Coolpix 5500. In post processing there was no need to boost contrast, nature had done that for me. All that was required was a little cropping here and there and blocking out number plates on some of the vehicles in the photos. And guess what, six years later the little Nikon it’s still making great trouble free images.